When using a trim tray, you always get a reward at the end. It's one of the most satisfying times of the trim besides being done. All that kief is sitting on the bottom. Trichome heaven. There are many different varieties out there ergonomic designed, various sizes of screens. Some even come with a holder for trimming scissors. We got you covered with the best trim trays for weed out there right now. Should you use a trim tray? You should use either a trim tray or something such as cardboard underneath your trimming. There will be a massive amount of trichomes falling from your cannabis all over. A trim tray also makes it easier to clean up afterward and keeps buds contained. Size of screen how many microns does it have if any. Non-slip bottom is a great thing to have especially on slippery table or counter-tops. Ergonomic design is needed when in trim jail for a long time. Improve your trimming? Some users of trim trays have found it to increase their trimming ability and also were able to trim longer due to the ergonomic design. The Honeybee trim tray is a perfect low-profile trimming tray. The design enables a smooth trim session. Also with a 150-micron stainless steel screen to filter all those amazing trichomes into a large tray below. The Honeybee trim tray has a non-slip base which is really nice when working on tabletops and prevent being knocked off the table. What we like is that you don’t have to rest your arms on the trim tray like other ones and caused less shoulder strain. When used on a table. Another cool thing is if you want a different size pollen screen, they have either a 100 or 200 micron available! If you're looking for a trim tray that's stepping up their game, it's the Harvest More Trim Bin. An ergonomic design specifically to reduce back, shoulder, wrist strain, and fatigue. With this design, trimmers have been able to increase their speed of trimming. That can make the difference when your job is to trim. What we like is that you can use this on any chair it is a portable trimming tray. High back and side walls to prevent spillage. Suited up with a 150-micron screen to catch all the falling pollen from your marijuana buds that you're finely manicuring. Talk about being environmentally friendly made with all recycled plastic a nice touch. 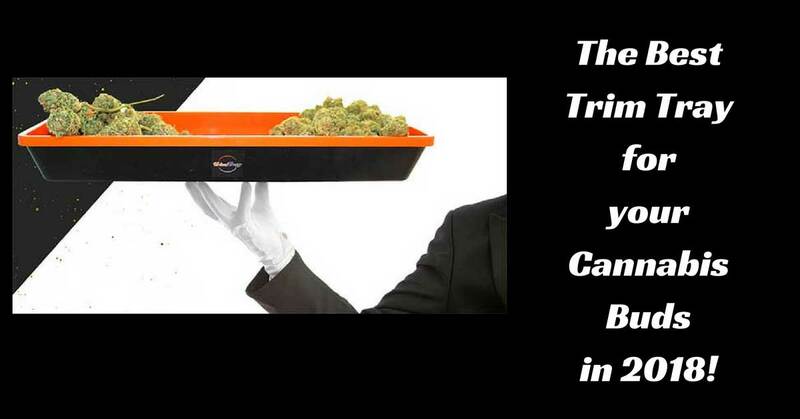 The Heavy Harvest trim tray has a multi-use that can be used on table top or your lap. The low side design reduces strain, and when using this trim tray, it can be quite comfortable. This trim tray comes with a 150-micron Tray Top which is great for filtering the trichomes that fall when trimming your dank bud. The only thing this doesn't have is a place to rest your beverage. One thing that cool is that comes with a magnifying card. To look at all those trichomes in the bottom tray. The Heavy Harvest also has smaller pollen screens available, like 200 or 100 micron if you want a finer dry sift. If you need a basic trim tray, then the Agree table top tray is the one for you. This trim tray has no fancy features such as a fancy micro screen mesh. A nice open front lets you trim and manicure your cannabis buds with ease. The sides and back are higher to make sure the trim stays in the bin. You can also use this to mix soil or coco for clones or transplanting. - 6 5/8" x 6 5/8" x 2 3/8"
Trim and manicure your marijuana in style. The large sifter box by Green Goddess is perfect for the small grower or anyone who wants to go old school. Fitted with a 100-micron screen for a finer pollen collection on a tempered mirror. The glass makes the scraping easy, smooth and ​static free. Each piece comes with magnets to prevent slipping. Packs away with ease and looks cool anywhere. The Gro1 Trim Station with trim tray is meant for small growers. What’s neat about this setup is that you can have a beverage holder (for a small glass) also hold an iPhone (smaller than 6 inches). This trim tray is meant to be on your lap, and you trim into a bag that is attached to a drop hole in the center. The trim station does not have a fine micro mesh; this is a basic trim job with no trichome collection afterward. It’s in the bag! You can hold about 6 ounces of herb on one side and about another ounce one the other if you pack it in. The trim station is a unique setup. 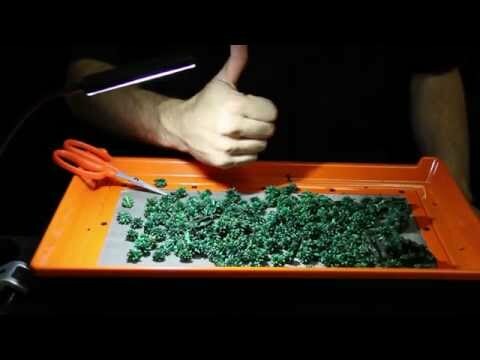 A trim tray is a must when trimming your cannabis buds. It catches and enormous amounts of trichome crystals of kief. Why let it just drop away. For some, this is their medicine. Like myself. I use the Heavy Harvest Trim Tray, it works well for my needs, and I love how easy it is to clean up the mound of kief left over. Perfect dry sift. Do you use a trim tray? Yeah man they are awesome, highly recommend it. Yeah the harvest trim bins are pretty solid. I really love my GRO1 Trim Station Trim Tray. It also makes the leftover trim really nice for rolling blunts and it’s ready to roll right out the bag.